there is a 50% chance that this is the grandmother with the hole in the head. when my grandfather frank was a little boy, his mother and their maids did a thorough spring cleaning every year. not content to just sweep up dust and clean out closets, this spring cleaning also included taking pictures off of walls so that the walls themselves could be cleaned. now, it so happened that, being a little boy, my grandfather liked to get into mischief whether or not the house was in spring cleaning disarray. one time in particular, he decided he was going to climb on top of a tall bureau and from there, catapult himself onto the bed. i don’t know how he didn’t notice that there was something on the bed before he launched himself off of the bureau, but maybe he thought he could jump around it. he couldn’t though and that’s how he ended up landing with one foot clear through a portrait of his grandmother, which had been taken off the wall and placed on the bed for spring cleaning. and, as you might guess, his foot happened to land right smack in the middle of her head. amalia looks so dignified in this picture that it’s hard to believe she could have been the grandmother this happened to – but she might have been. 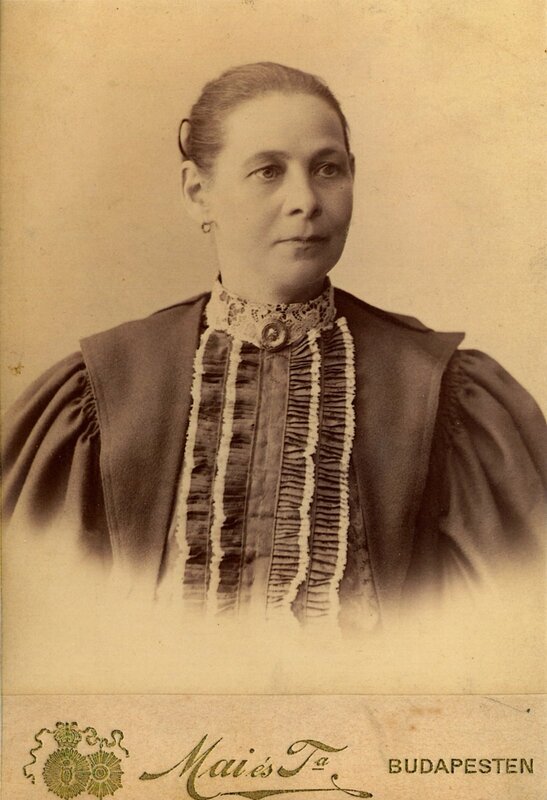 i don’t really know very much about her or about the other candidate for grandmother with the hole in the head (who was named katharina and of whom i don’t have a photograph). from one of frank’s first cousins, who i corresponded with when i was in junior high and high school, i know that amalia died of heart problems in an oxygen tent in vienna. i also know that she was the sixth child of ten, born in a small town in slovakia, and she looks pretty darn good in this photograph for a woman who bore twelve children. but that’s it. so i’m going to pretend that she was the grandmother with the hole in the head, which is hopefully not horribly disrespectful. i don’t mean it to be. but it at least gives me more to embroider into amalia’s story, one which i wish i knew more about. « anna and celia, ca. 1900? i also now know that amalia and her husband nathan were relatively fancy, because the photography studio where this photograph was made was owned by the official court and imperial photographer, < HREF="http://www.maimano.hu/maimanohaz_02_en.html" REL="nofollow">mano mai<>, whose house is today a major photography museum in budapest. thank you, google. I think it is incredibly cool that you are putting all these stories into a file, thanks. well, i’m just glad that you think it’s interesting, too.